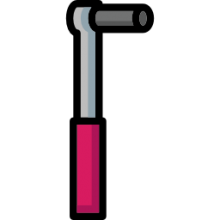 An extendable ratchet is a type of socket wrench that has a socket on one end, generally employed to turn a fastener (Wikipedia). The ratcheting socket wrench is a specialty hand tool that uses a metal handle connected to a ratcheting head, which is attached to a socket (Source). This ratcheting head fits to a nut or bolt to be pulled or pushed in one direction, either tightening or loosening the nut or bolt. You can re-position the handle without turning the socket for easy, powerful turns (Wikipedia). By performing this 'ratcheting' action, the fastener is quickly loosened or tightened, all while the extendable ratchet remains connected to the fastener (Source). Breaker bars are generally considered more powerful, but many buyers we spoke with said that these telescoping socket ratchets provided enough power for most of their needs. The Stanley Tools extendable ratchet has 8 & 12 point SAE sockets. Its handle telescopes to 14". It's able to lock into 5 different lengths with a locking flex head. Stanley provides a lifetime warranty, as well. One hobbyist mechanic told us that he's pleasantly surprised by the the torque he's generated from this ratchet- saying that fully extended to 14", it's powerful enough to disregard his 24" breaker bar. He also endorsed the socket's extra teeth, which enabled him to pry into tight crevices. Let's take a look at 5 of the best-selling options on the market today and see how they compare. The AmPro Extendable Ratchet 4.6 $ 17.5"
The Stanley Extendable Ratchet Set 4.5 $ 14"
The Steelman Pro Extendable Ratchet Set 4.3 $$ 19"
The Neiko Extendable Ratchet 3.7 $ 12 3/8"
The Pittsburgh Extendable Ratchet 3.3 $ 18"
This ½-inch standard extendable ratchet offered by Ampro is well-balanced, handy, and an excellent addition to your toolkit. 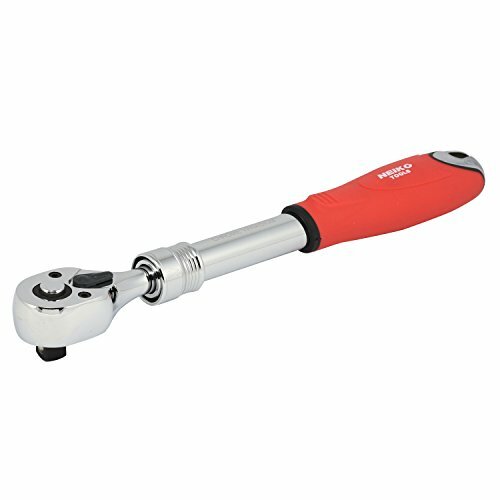 Users love the cushioned grip and the length of the ratchet, but some do note that they had problems with the warranty. The extendable ratchet measures 11” x 1.3” x 1.3”, and it features six locking positions, 72-tooth geared action, a quick-release coupler, and a weight of 2 pounds. The ratchet extends from 12 inches to 17 ½ inches, and it has a forward/reverse thumb switch. Overall, this is a perfect tool for removing hard to reach bolts. In general, users have a high opinion of the Ampro drive standard extendable ratchet, and they praise its design, functionality, and durability. A buyer comments that he used the ratchet extensively and that he hardly encountered any problems. He highly recommends it to anyone looking for the best ratchet available. Another customer shares that this is his new favorite tool and that it provides great leverage. He states that the ratchet fits perfectly in his tool bag and that it’s well-built and comfortable to use. A purchaser adds that he liked the extendable ratchet so much that he bought a second one as a gift and that it’s perfect for lug nuts. However, some customers have complained that the handle gets stuck in the short position and that they had problems to unstick it. A user also states that it broke quickly. If you are in need of a reliable extendable ratchet set, you might take a look at this 3/8-inch ratchet tool offered by Stanley. Users love the extendable handle, but some do note that it’s expensive. The Stanley ratchet measures 12.8 x 5.7 x 1.6 inches, and it features a locking flex head, a weight of 2.5 pounds, and a limited lifetime warranty. The handle extends up to 14 inches, and it locks in five different lengths. The package also includes eight 12 point SAE sockets so this is an excellent choice for the average handyman. A purchaser that the Stanly extendable ratchet set is a necessity for everyone that works on cars, trucks or motorcycles and that its quality exceeded his expectation. The reviewer adds that this is the best extendable ratchet and that he highly recommends it. Another customer mentions that he bought two of these ratchets and he doesn’t have any complaints. He adds that it’s simple to lock the head into the position you need and that it’s ideal for getting extra torque. Another user states that he has been using the extendable ratchet set for more than three years and that he doesn’t have any issues with it. As a professional mechanic, he highly recommends it for removing rusted bolts and nuts. However, some customers have complained that they had problems losing rusted bolts with the ratchet and, they are disappointed by its performance. 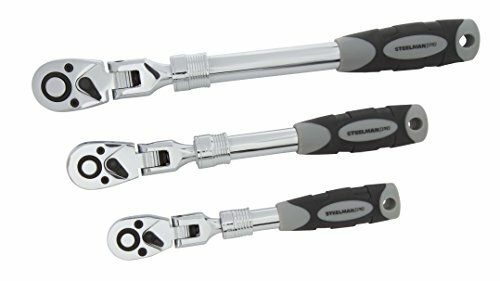 This 3-piece extendable flex head ratchet set offered by Steelman Pro is well-designed, well-balanced, and a product of high quality and design. Users love that the set includes three extendable ratchets, but some do note that it’s expensive. 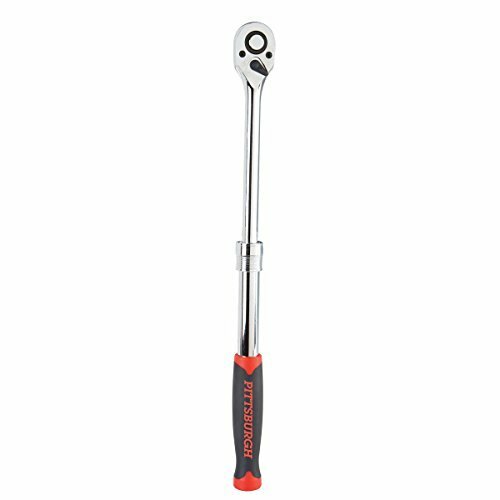 The Steelman ratchet measures 15.2 x 2 x 6.2 inches, and it features a heat-treated chrome vanadium steel construction, 180-degree flex heads, a 72-ratcheting mechanism, and a quick-release button to remove the socket easy. The set includes a ¼-inch ratchet that extends from 6.75 to 8.75 inches, a 3/8 ratchet that extends from 9.5 to 13.5 inches, and a ½ inch ratchet that extends from 13.5 to 19 inches. In general, users have a very high opinion of the Steelman Pro extendable ratchet set, and they praise its design, performance, and durability. A buyer shares that you can’t find a better tool if you need to work on your car and that he highly recommends this ratchet set. He adds that the extendable ratchet is made of quality material and that he is very satisfied with its performance. Another customer comments that the extension is very handy and that it allows him to loosen difficult to reach bolts and nuts. The reviewer says that the extendable ratchet is professionally made and that it’s the best ratchet set available. However, a customer has complained that the handle of the largest ratchet doesn’t lock in place. This 3/8 inch drive extendable ratchet offered by Neiko is cheap, reliable and efficient for loosening bolts and nuts. Users love the price and that the ratchet is extendable, but some do note that it doesn’t work as well as they expected. The Neiko extendable ratchet measures 12.1” x 2” x 1.3”, and it features a heavy-duty drop forged construction which is heat-treated for durability. It also has a fully reversible handle, a quick-release drive head with a spring-loaded ball, and a weight of 1 pound. It extends from 8 ½ inches to 12 3/8 inches. A customer shares that he uses this extendable drive ratchet to reach cramped areas and that the quality is exceptional. He adds that you can apply a lot of torque without worrying about damaging the ratchet. Another user mentions that the ratchet is strong and well-made and that it’s one of the best ratchets he has ever encountered. The reviewer states that the ratchet is light, comfortable to use and fits nicely in a tool bag and that it would probably last for many years. He highly recommends it to anyone who needs extra torque. Another purchaser says that you don’t need a breaker bar if you have this ratchet and that it’s perfect for any mechanic. However, some customers have complained that the tool is heavy and bulky and that it doesn’t look like the provided picture. This ½ drive extendable ratchet offered by Pittsburg is handy, light, sturdy, and ideal for hard to reach areas. Users love the length and the price of the ratchet, but some do note that they had problems with the handle. The Pittsburgh ratchet measures 12.5 x 2.6 x 1.8 inches, and it features an oil-resistant TPR handles for better grip, a 72-tooth gear action, a heavy-duty chrome vanadium steel construction, and a weight of 2.1 pounds. This extra long ratchet extends from 12 inches to over 17 inches, and it has six locking positions which make it perfect for any mechanic. In general, buyers have a mixed opinion regarding the Pittsburg extra long extendable ratchet, and they mention some quality issues. A purchaser states that the end of the handle is plastic and it broke while he was working. Otherwise, he says that it’s easy to lock the ratchet in position and that the collar that allows you to lock it works smoothly. Another happy reviewer mentions that he has been using the ½ inch extendable ratchet for almost a year and that he doesn’t have any problems with it. He adds that he had used it on extremely rusted bolts and that it performed exceptionally. But another customer has complained that the Pittsburgh ratchet broke after a week and that he is disappointed by the quality. The first extendable socket ratchet we examined is manufactured by AmPro- it is capable of extending from 12 inches all the way out to 17.5 inches with six different locking positions. Buyers we spoke with say that it weighs around 2 pounds and is fairly durable for automotive work with some users saying they slammed it with a rubber mallet to loosen up bolts without any harmful repercussions. Another home car repair hobbyist told us that he purchased this extendable ratchet because his new lug nuts no longer worked with his spare tire wrench. Overall, he told us that its handle made tightening his car tires' lugnuts pretty easy to do, especially when not extended to its full length. Another reviewer chimed in and said that unlike cheaper Chinese knockoffs the ratchet's head and extension lock are machined well, allowing it to smoothly collapse and extend. If you require an extraordinary amount of torque, you may want to resort to a higher-powered option, but for most users the AmPro extendable ratchet works well- with users saying they've tested it up to 120 ft-lbs on sports utility vehicles. The Stanley extendable ratchet set was the second we examined- it ships with eight 12 point sockets with a handle that extends to 14 inches and locks into five different lengths. Buyers were impressed by the inclusion of a socket rail, while some users did note that the quality overall wasn't exceptional with the ratchets being adequately built but the sockets' walls were too thin for some reviewers liking. As other buyers of extendable ratchets have told us, if you are prying a really rusted bolt, sometimes it's best to resort to a more powerful breaker bar- though for most automotive mechanic uses these telescoping ratchets are sufficient to the task. One hobbyist we interviewed told us at the ratchet set is fairly dynamic- shipping with a locking flex head, and true power when extending it to its maximum length of 14 inches. Another mechanic says that Stanley typically produces high-quality hand tools and this particular extendable ratchet set is no exception- indispensable for people who work on motorcycles, cars, and trucks and it also ships with a lifetime warranty. Indeed, this buyer follows up with us telling our staff that the sockets have extra teeth, enabling them to access tighter places you cannot easily see, providing just enough extra torque to get difficult jobs done. The third extendable flex head ratchet set we looked at is manufactured by Steelman Pro. They advertise it as a dynamic option that ships with three different telescoping ratchets all of them treated by heat and built from chrome vanadium steel designed for rugged and extended durability and strength. In addition, they have been engineered with 120° flexing heads, enabling auto mechanics to dive into difficult to access nooks and crannies of their customers' vehicles. Also, they feature a built-in button that when pressed will quickly release sockets- meaning a struggle-free swap of socket heads as you work. Reviewers we spoke to said that the shaft is, in fact, notched with locking lengths as opposed to being notched for positive locks or pressure tension. One automotive mechanic told us that has a car repair expert a set of extendable ratchets is indispensable to his daily work- and he says he purchased this pair to complement his non-adjusting ratchet set and has been highly impressed by their strength and durability. The fourth extendable ratchet we examined is manufactured by Neiko and is differentiated by its soft ergonomic handle. The manufacturers advertise this as a heavy duty option that is fully reversible, featuring quick release drive heads that are spring loaded for the locking sockets. The ratchet extends from 8 1/2 inches all the way to 12 3/8 inches. Buyers endorse this as a breaker bar, since its adjustability enables truly dynamic applications- letting you work on automobiles that have really cramped interiors. Buyers write of applying a tremendous amount of force to this ratchet and saying that it has broken rusted bolts loose and the ratchet has not suffered any ill effects. Indeed, the further the ratchets extended the greater amount of torque provided, functioning as a competent stand-in for breaker bars- its a must buy for any competent mechanic struggling with lug nuts that have been over tightened or rusted over. The last option we examined was the Pittsburgh extendable ratchet- it can extend from 12 to 18 inches and features six different locking positions in able to accommodate up to 400 pounds of torque. One buyer complained that the end of the Pittsburgh's handle which is made from plastic broke- this means that it loses some of its extendable length, depriving this mechanic of needed torque. As other buyers have noted, once extended these extendable ratchets can oftentimes double for breaker bars in many automotive applications. Indeed, as we have seen, many reviewers are auto mechanics who prioritize purchasing collapsible ratchets to keep on hand to loosen lugnuts and work on oftentimes inaccessible and tight areas of cars.